Isn't she gorgeous? When I first saw this block, made in other colors, it was ugly to me. But my March hostess in the Simply Solids Bee is Lisa and her color choices were awesome! (and big Kudos for sending the fabric out super early)! You know what else, she had precut all the fabric, precut the templates AND labeled each section with the color of fabric - talk about a breeze. Thank you Lisa! I was so excited to get started that I have already mailed it back, and it isn't even due until end end of March! 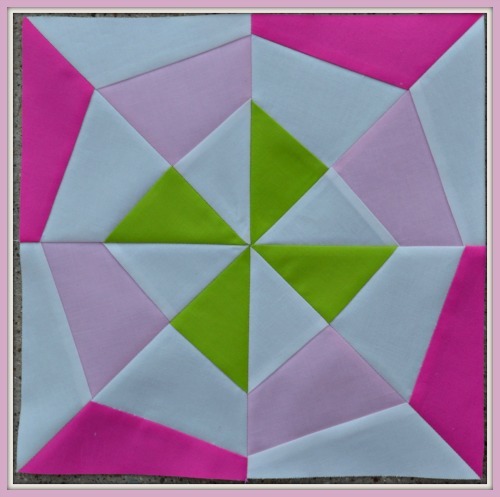 Quilting is so fun because as you see blocks come together in ways you had not visualized, it's like a flower opening up as it blossoms. That is how I would describe this block. Check your mailbox Lisa - it's on the way! The prettiest web I ever saw! Very cool. Look at those seams! Good job.